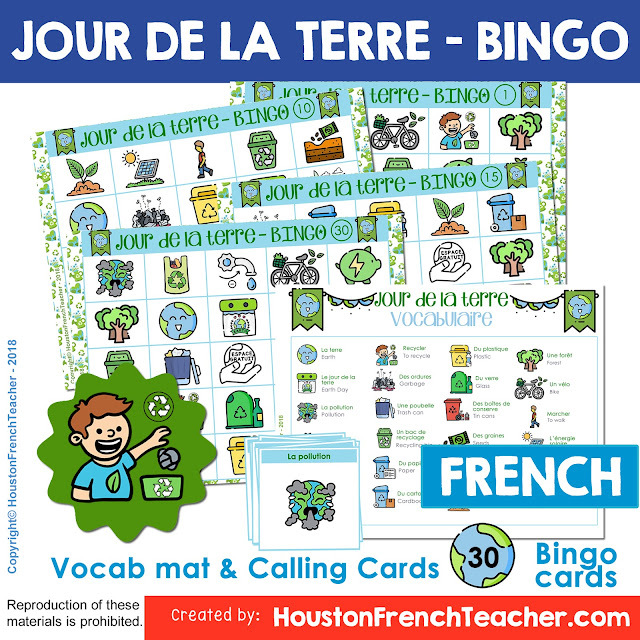 Jour de la Terre French Earth Day Bingo (30 Cards & Word Mat) (30 different Cards with Jour de la terre (French Earth Day Activity) Vocabulary Word Mat & Calling Cards) All Ready to print - No prep! Looking for a fun activity for Jour de la Terre French Earth Day? This is a great way for students to learn/review the Jour de la Terre French Earth Day vocabulary. With the vocabulary word mat, students can review the vocabulary before the bingo game or as a helper during the bingo game - perfect for differentiation. The 30 bingo cards are also numbered from 1 to 30. To keep playing, I ask students to exchange their cards randomly or by odd or even numbers.